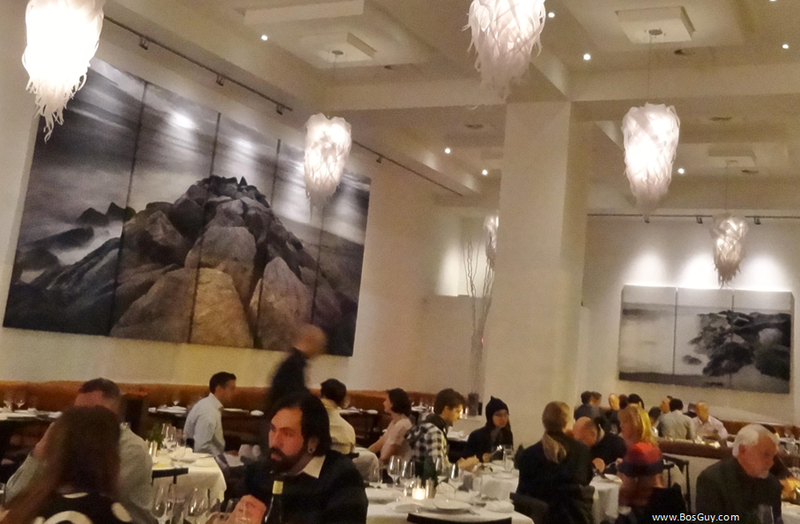 Ostra opened late last year in space formerly occupied by Avila in the Back Bay. Executive Chef Mitchell Randall describes his food as “contemporary Mediterranean” with a focus on seafood; fear not there are options for meat lovers too. Ostra is Columbus Hospitality Group’s 5th restaurant in Boston and 6th in the area; it is a welcome addition to CHG’s collection of power dining options and sister restaurants (Mistral, Sorellina, Teatro, Mooo, and L’Andana – in Burlington). The restaurant is beautiful with white walls offset by large, dramatic paneled photographs of the ocean. The caramel colored leather booth seats and hints of gold add interest, but I really liked the custom chandeliers inspired by jellyfish that float high above the dining room. Ostra also features a beautiful baby grand piano (nightly entertainment is set to start in February in their lounge) next to a comfortable long bar that seats approximately 15. Main dishes at Ostra range from $28 to $90 (a dinner option for 2). 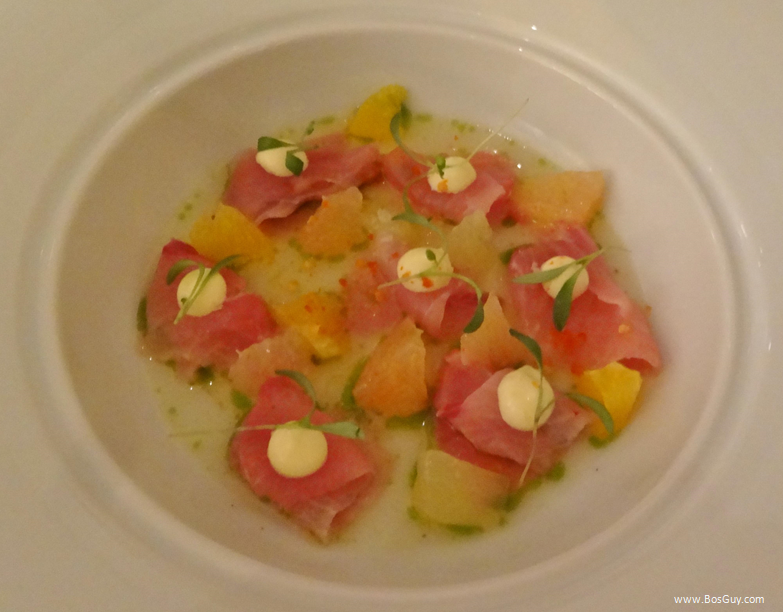 I started my first meal at Ostra (I will be back) with the Hamachi ($19). There is a hint of heat courtesy of jalapeño oil and pepper, but it is very subtle and offset by the citrus. I thought the starter was as visually beautiful as it was delicious to eat and I’d highly recommend it. Following our first plates, my friend and I continued to nibble on the warm bread and butter, while we chatted and sipped our cocktails. 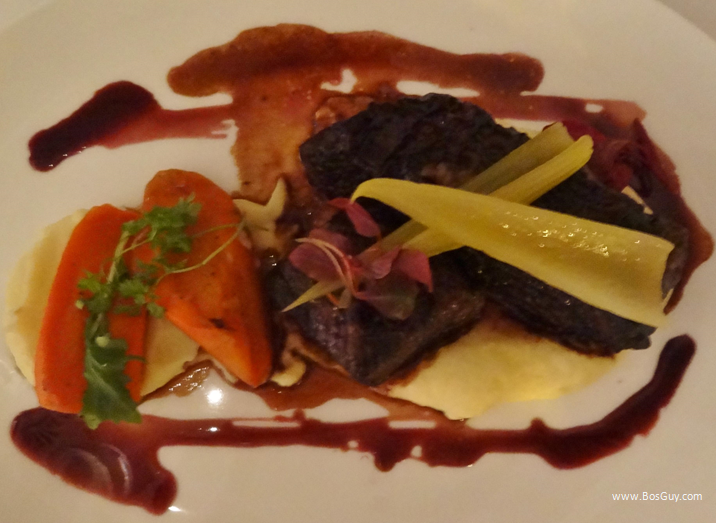 My friend tried the Malbec braised beef short rib ($42). This was unbelievably tender and flavorful – meat lovers take note. I had been torn between a few options but our helpful (and distractingly handsome) waiter, Carlos, won me over with his description of the Native Cod ($36). The fish was cooked to perfection and the accompanying sweet garlic whipped potatoes and mushrooms really made the dinner special. The porcini mushrooms definitely added an earthy taste to the dinner and I made a concerted effort to include a bit of everything in each bite to enjoy all the flavors together. 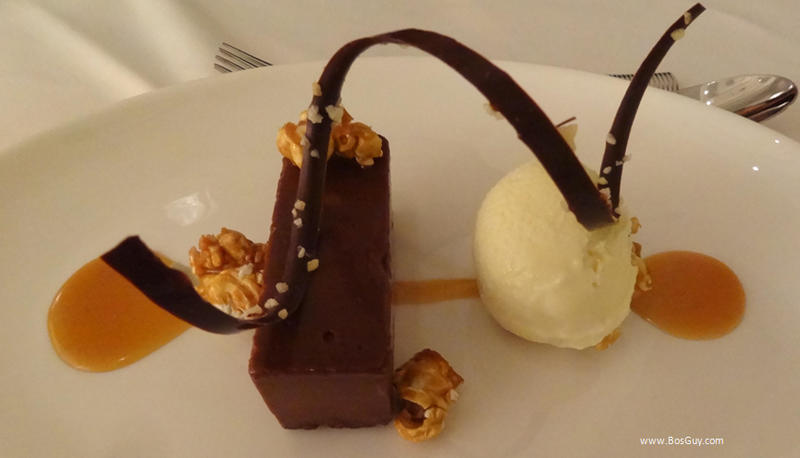 Although I’m not much of one for ordering desserts in the name of ‘research’ we opted to try the Chocolate Hazelnut Cremeux ($13) – again a recommendation from our waiter, Carlos. As with all the plates that come out of Chef Randall’s kitchen, the dessert only entices you more when you see it so beautifully plated in front of you. 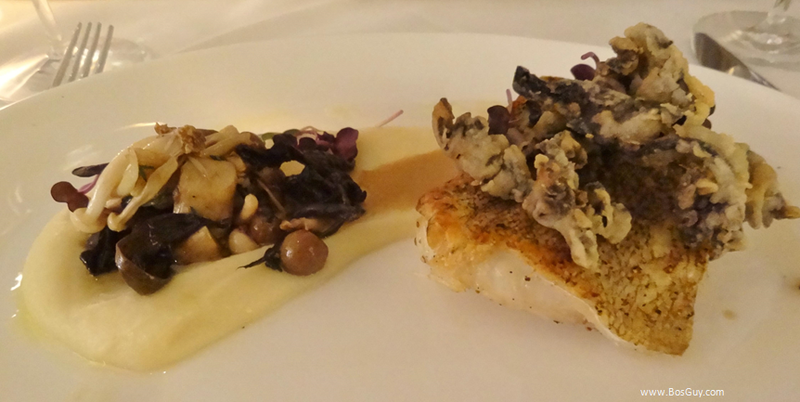 Ostra is a fine dining restaurant and a welcome addition to the Boston dining scene. Service from the moment I walked in to the moment the door was closed behind us was flawless. Our waiter was helpful without being intrusive and the GM, Alex Hage, whom I met when I walked in was so helpful answering all my questions about the restaurant and menu. Another way to enjoy this new restaurant is to visit their lounge. Nightly entertainment will begin in February so patrons can enjoy a cocktail (or two), sample some of Ostra’s raw bar or share a plate while listening to the piano player. The desserts look nice. the rest looks like typical new wave French bistro food-which can be good if you had dinner recently at Septime in Paris. All places look the same today only the food is different. I love Chops especially the one n Npales, Fla.